Classes started this week aboard a unique floating classroom. 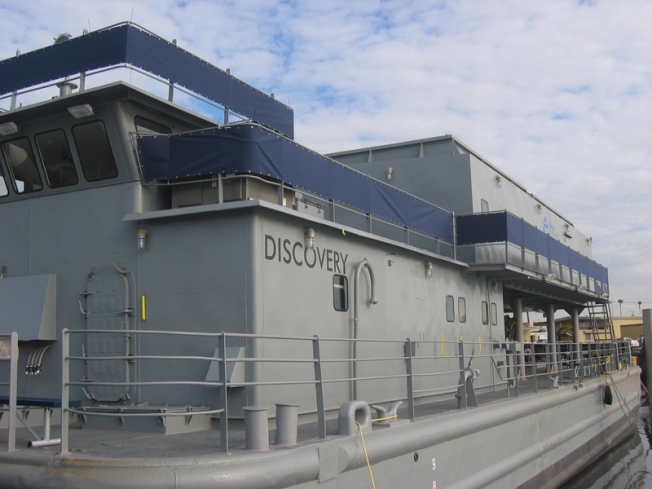 The National University System has converted a former U.S. Navy vessel into a floating campus rechristened “Discovery” for one of its affiliates, the National Polytechnic College of Science. Prior to its arrival at the Port of Los Angeles, Discovery underwent a year-long retrofit at the Marine Group Boat Works in Chula Vista near San Diego. The 110-foot long, 34-foot wide vessel is now a fully functional campus with two 25-person state-of-the-art classrooms, central office complex, faculty offices, computer lab, on-board 8,000-gallon training tank, dive stations, hyperbaric chambers, welding stations and maintenance shops. Classes aboard Discovery will begin in February 2009. Discovery offers a one-of-a-kind learning environment for students at National Polytechnic who are pursuing careers in commercial diving, underwater welding, advanced dive medicine.